Ultra-small SCARA robot with increased transportable load capacity and higher speed - News Releases | Yamaha Motor Co., Ltd. The Yamaha Tiny SCARA Robot is a palm-sized (in terms of the area of its mounting surface), compact horizontal-multi-joint-type robot and has been developed under the concepts of high precision and compactness to meet diversifying user needs such as miniaturization of assembly parts and compact production facilities. The YK180X/YK220X are variation models that have inherited the characteristics of the previous Yamaha Tiny SCARA Robots with significantly expanded transportable load capacity and faster speed, and they are expected to expand the robot market. In recent years, manufacturing plants that require less space, such as “desk-top factories,” have been popular and this has accelerated the trend toward more compact production facilities significantly in the field like electric/electronic component manufacturing. At the same time, the spread of handy-type products such as mobile phones has been accelerating the miniaturization of components and more users are now asking for precision of assembly at the level of a few microns. Against a backdrop of such market demands, Yamaha Motor Co., Ltd. has been developing and supplying to users its Yamaha Tiny SCARA Robots, which make ultra high-precision assembly possible. 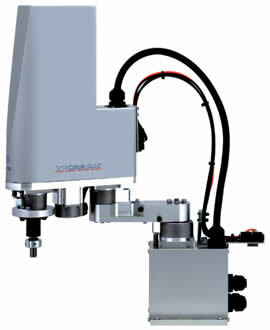 The new Yamaha Tiny SCARA Robots “YK180X/YK220X” have inherited characteristics of our previous models such as 4-axis control, highly compact design (minimum installment space) and superb positioning precision with further developments such as much larger transportable load capacity and reduced cycle time. These products are expected to be used not only in the field of electric/electronic product/component manufacturing, but also in the medical field for pharmaceutical, medical equipment and medical testing uses. Arm lengths are 180 mm (YK180X) and 220 mm (YK220X). The footprint is also small at 112 mm x 105 mm and there is greater flexibility in system design. Position setting precision of the X and Y axes: Comparable precision to the previous models of ±0.01 mm has been maintained, so it is possible to use applications to assemble super-small components with a high level of accuracy. The transportable load weight is 1.0 kg, which is twice as much as the previous Tiny SCARA Robots. R-axis Permissible Inertia Moment has been increased 5-fold to 0.1 kgfcms2. A capability equivalent to SCARA robots of two classes higher is maintained, thus enabling heavy-load operation despite the robot’s small size. The X and Y axes have a combined speed of 3 m/sec (YK180X) and 3.7 m/sec (YK220X) and standard cycle time is 0.39 seconds, which is the top class among Yamaha SCARA robots. Complete return-to-origin functionality is included as standard, so the return-to-origin operation has become unnecessary and start-up time loss has been reduced to a minimum. The model has been fitted with six user wires and pipes off3x2 as standard equipment to enable compact layout of piping and wiring. The combination of the flexibility, a characteristic of SCARA robots, and the designated controller has made programming of complicated motions easy. The products can be used for the purposes including assembly, conveying and transfer at production facilities in the electric/electronic industry where accurate assembly is required. Also they are expected to the application to the assembly of the parts for medical equipment and the process of medical testing. SCARA stands for Selective Compliance Assembly Robot Arm and describes a type of robot has compliance (softness) only in horizontal direction (x-y direction) but has high rigidity vertically and is built mainly to automate assembly work. Today, SCARA robots are used in various production processes because they are also effective for conveying works (pick & place) due to their fast operation. Another benefit of the SCARA robot is that it requires only a small installation space but has a wide motion range, and flexible layout design around the robot is also one of its characteristics.